It was words, thoughts and soaring oratory that kept them going through the darkest of days. Those, and the unshakable belief in themselves and the righteousness of their cause. Mandela believed that even his young Afrikaner warders were, themselves prisoners, of circumstance and ignorance. So he insisted that they too study. And by sheer force of will and transcendent spirit he conquered these forbidding circumstances, and elevated this grim prison to the status of a veritable University. With Shakespeare at the center of the curriculum. The ongoing memorial ceremonies and celebration of his life have been inescapable these last few days so I will try to avoid repetition of the well published encomia from heads of state across the globe. We must ask ourselves, however, who was this man that radiated such graciousness and statesmanship and who preached and practiced reconciliation despite the injustices and indignities heaped, for decades, upon himself, his family and his people? He was an enigma. Loyal to a fault. He maintained friendships with the Castros, Gadhafis and Arafats of the world despite their political toxicity to much of the West. Yet he forever foreswore the divisive poison of tribal nepotism and racial enmity that lies at the root of so much conflict. Ladies and GentIemen, I would submit that he caused the entire world to recalibrate not only the standards by which statesmanship on the continent of Africa would henceforth be measured, but he has reset the bar for all leaders, everywhere. He has, simply, redefined what it is to lead. As we honor Nelson Mandela today and celebrate his life, allow me to take you all back 14 years. It was September 1999. And we had just got word that he and his wife Graca Machel were coming to Seattle. And this Rotary club was to have the opportunity of hosting them. Arrangements were made with Maestro Gerard Schwartz to hold the event at Benaroya Hall and, given our guest’s love of music, a concert would be held in his honor. We would include all of Seattle’s school principals and vice principals and as many children as possible, including a choir to sing the new national anthem of the world’s youngest democracy. Then we had an even better idea. I called Zelda la Grange, the fiercely protective young Afrikaner who Madiba had selected as his personal secretary. She who guarded him like a lioness. “Zelda…how would the president like to conduct the Seattle Symphony Orchestra?” I asked. The next day she called me back “The president says that he’s never conducted an orchestra before” she told me. And I remember, just before the concert, in Gerard Schwartz’s office watching Seattle’s maestro present, with a new baton, the conductor of my motherland’s transition to democracy, and then coach him in how to conduct an orchestra. Later, immediately after the Symphony’s performance in his honor, I had an other-worldly experience. I was escorting Madiba, surrounded by Secret Service agents, through Benaroya Hall’s passageways down to the stage, all the while listening to him and Zelda chatting away confidentially in Afrikaans. And I was, reminded of the words he had written while on Robben Island. And then, hire his daughter as your most trusted secretary. For those of you here today who remember that occasion, Madiba covered many subjects. Global politics, race relations, and HIV Aids prevention. He did not pull punches. After the event I asked the high school age daughter of a friend what she thought. 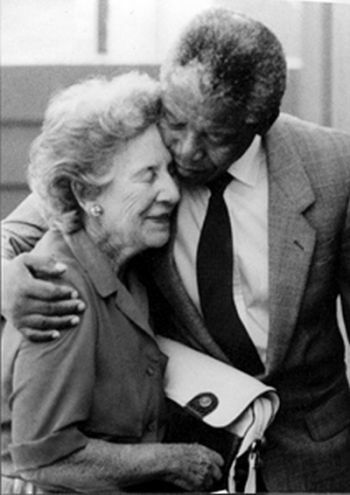 My aunt, Helen Suzman was, effectively, in the 1960s and 70s, the sole opposition parliamentarian, and she insisted on visiting Robben Island repeatedly. She was fiercely outspoken about conditions there, and whenever she was scheduled to visit, extra blankets were issued and conditions improved temporarily. She and Mandela became firm friends. “What does the President want me to be doing?” Helen responded. “He’ll pick you up at your house,” she was told. Which is what he did. Exactly 17 years ago yesterday. And after a helicopter ride from a nearby rugby field they arrived at a stadium in Sharpeville packed with ecstatic ANC supporters waiting to witness the signing of one of the world’s most liberal constitutions, created with the help of scholars from around the world. An effort chaired by Cyril Ramaphosa who accompanied Madiba to Seattle and who is now the Deputy Vice President …next in line to lead the country. Helen was warmly greeted by dozens of Robben Island University alumni who were now part of the new regime. She was not someone who was easily moved, but moved she was that day, and deeply. He was a politically canny man. Like President Lincoln 130 years earlier he recognized the value of a Team of Rivals, of gathering his opponents around him. And just as Ulysses S. Grant, at Appomattox in 1865, had treated with deference and respect the defeated Robert E. Lee, and told him that his men should take home with them their horses and side-arms to start rebuilding a war torn nation, so did Mandela instinctively understand that you always allow your former foes to retain their dignity. Never denigrate anyone. He would have made a wonderful Rotarian, as he instinctively applied the four way test to everything and everyone he touched. Ladies and gentlemen, allow me to take you back to the British Museum late last year. I would suggest that on 18 July 1918, at Mvezo on the Mbashe River, at the birth of Nelson Rolihlahla Mandela, God did indeed bless not only Africa but the entire World. May we all honor a life well lived by trying to emulate its graciousness. I will ask you now, in honor of a most valiant man, please to stand, for a moment of silence. POSTSCRIPT: BlackPast.org urges you to support VillageReach, the charity which was established in Seattle in 1999. VillageReach’s initial project was to expand access to viable vaccines in Mozambique’s northernmost, least accessible provinces. The program which continues to this day is expanding to additional provinces, and has ensured the vaccination of hundreds of thousands of children in otherwise underserved communities. VillageReach is now also involved in helping strengthen health systems in other African countries. President Mandela and Ms. Machel became, and remain, honorary board members of the organization which was born of their Seattle trip. Paul Suzman continues to serve on its board of directors. “I Remember Madiba: Honoring the Life of Nelson Mandela,” Eulogy Given at the Seattle Rotary Club, Seattle, Washington, December 11, 2013. Reprinted with the Permission of Paul Suzman. at the Seattle Rotary Club, Seattle, Washington, December 11, 2013. Reprinted with the Permission of Paul Suzman.